Ladies Ecco Shoes Size Uk 6 Euro 39 Worn Once Indoors . In excellent condition. There’s a pattern in the uppers as seen in the pictures. Mushroom colour. Size UK 6 (EU 39). In good condition, as can be seen in the pictures. Ecco Walking Boots size 6. Condition is New with box. Padded internals Nubuck outer Dispatched with Royal Mail 2nd Class. ECCO SIZE 6. Condition is Used. Dispatched with Royal Mail Signed For® 2nd Class. Please check out my other items. My late mum had some lovely clothes, handbags and shoes! Ladies Ecco Grey Leather Heels. Lovely soft leather heels. Hardly any signs of wear to heels and soles, a couple of minor marks on top fronts of shoes but no scratches or scuffs. Ecco Shoes Grey EU 41 / UK 8. Condition used. Lovely grey colour, selling as I don’t do heels! Cushioned insole. Soft Leather upper, Flexible sole. Ecco womens Peep Toe shoes Size 6. Unworn No 📦 White Heel 3 inches Size 6. EUR 39 New Others listed Can combine postage Dispatched with Royal Mail 2nd Class. ECCO Office/Formal Shoes Size 40 / 6.5. Real Leather. Very Comfortable. Lovely pair of Ladies ECCO Black Leather Court/Loafer Style Slip on heeled Shoes. Worn a couple of times but still in great condition (please see photos as they form part of description) Lovely soft leather & very comfortable to wear. Size 40/6.5. Perfect for everyday/Office wear. Approx 3" snake design heel. A bit of a mark to inside from where the label was, otherwise fine. Will be carefully packaged & sent Royal Mail Signed For. Am sorting through my jewellery, shoes, clothes etc & am happy to combine postage. Anyone interested outside of the U.K please ask about postage costs if not using GSP. Many Thanks. A pair of Ecco black leather open toed shoes in excellent condition. Heel approx 3”. Now, more than ever, we all need to think differently about the food we throw away, the fossil fuels we burn, our carbon footprint, and yes - the possessions we all own. Label says: Sz 4 UK, 37 EUR. New, Unworn. Lovely brushed suede. Leather heels. In excellent condition. SOFT SUEDE LEATHER TRAINERS. IN EXCELLENT CONDITION WORN ONCE. ECCO Ladies Smart Black Real Leather Shoes Size 41 UK 7.5. Good used condition. Following surgery I can now only wear flats so grab a bargain! BLACK STRAPPY MULES SHOES by ECCO. SIZE 5 UK 38 EU. Comfortable and supporting inlay sole. ECCO Ladies Support Insole. Made of Pecari leather. Beautiful leather lined grey pan tent leather loafers suitable for smart of casual. Good condition. Right shoe has small scuff at the toe (see photos). Lovely Pale Yellow Ecco Heels Size 6. Condition is Used barely worn, see photos of sole of shoes. Soft yellow leather, very comfortable to wear with 2 inch heel. Dispatched with Royal Mail 2nd Class. Ecco Grey Heeled Shoes; Size 39. Dispatched with Royal Mail 2nd Class. 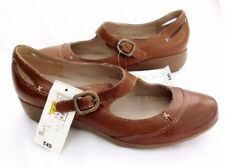 ECCO PEEP TOE WEDGES UK 6 EUR 39 IN TAN LEATHER. I have listed the condition as used, but in fact I have never worn them therefore are in fab condition Dispatched with Royal Mail 2nd Class. Lovely quality patent, with block heels. There’s Ecco Shoes have had very little use. Lotta off wear left. Ladys Ecco Shoes. Condition is Used. Dispatched with Royal Mail 2nd Class. Still in good all round condition. Beautiful suede brown ladies shoes, approx 2” heel. Used once. (Marks on the leather are only as it is soft leather and I can't find any clear shoe oils ;). Sole still in really good condition. A quality pair of black leather loafers in immaculate condition, lined with leather, with stirrup detail to the fronts. Ecco Black Real Leather Court Shoes. Size UK 5 EU 38. New without box. St Class Signed For within the UK. UPPER – 100% LEATHER. LINING – 100% LEATHER. SIZE EU 38 – UK 5. 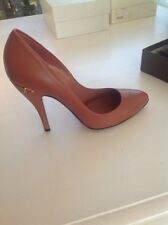 IN EXCELLENT CONDITION WORN ANCE HEEL 2"
I WILL SEND IT IN ANOTHER SHOE BOX. MADE IN ITALY. 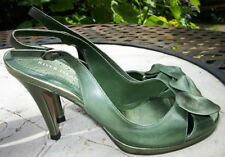 For sale are these gorgeous Ecco Brooklyn heeled ladies court shoes. A fashionable, sophisticated pump made from design leathers. They are marked EU Size 40 but are UK SIZE 6. Colour: black-gold antic.